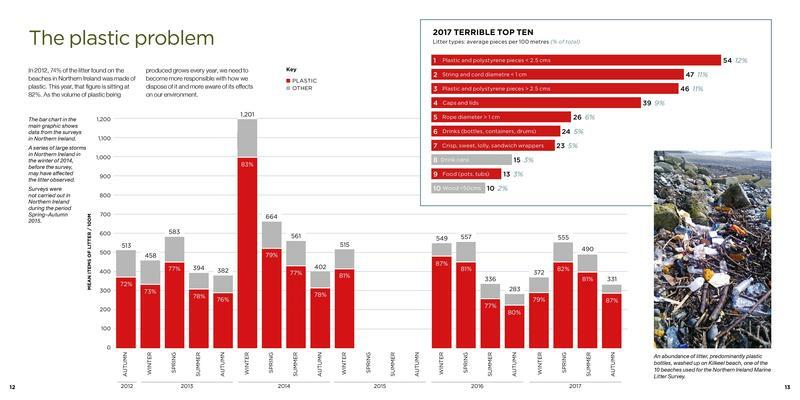 "Marine litter currently poses a dire, vast and growing threat to the marine and coastal environment"
You can view and save the 2017 Marine Litter Report here. View our summary postcard here. The Marine Litter Survey is generously supported by the Department for Agriculture, Environment and Rural Affairs. 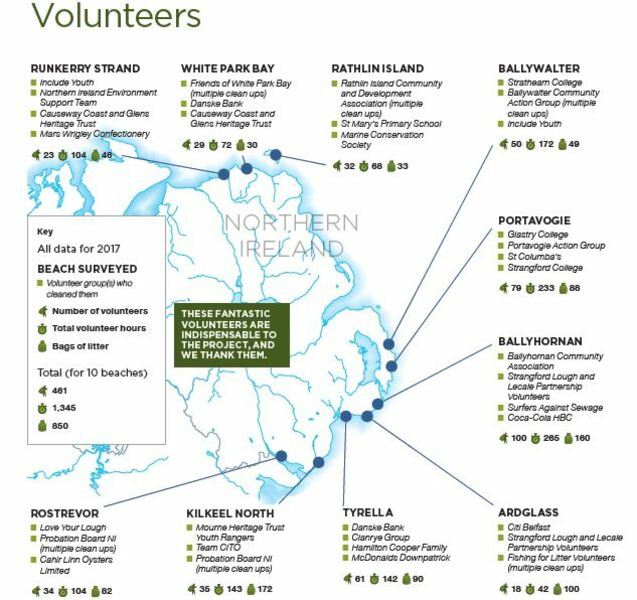 Since 2012 Keep Northern Ireland Beautiful have run a programme collecting information about marine litter washing up on ten beaches around Northern Ireland. 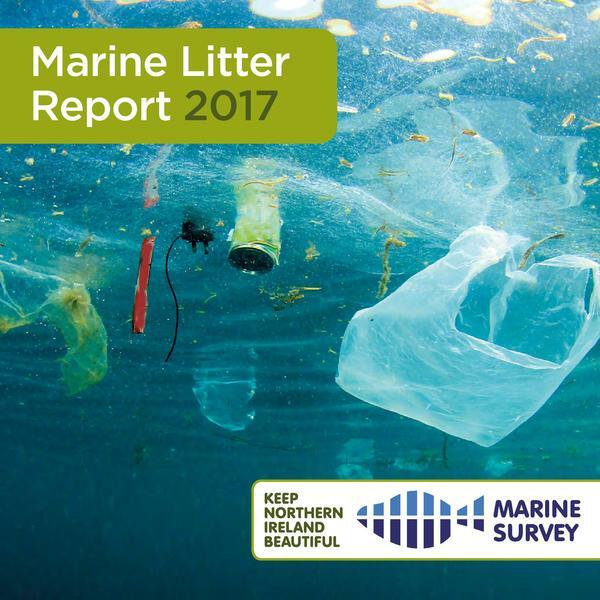 With four surveys carried out each year, the data collected contributes to the Northern Ireland Marine Litter Strategy. The aim of this Strategy is to help realise the vision of �clean, healthy, safe, productive and biologically diverse oceans and seas�. Over the 60 kilometres of beach surveyed under the programme, there have been an average of 510 items of litter per 100m from 2012 to 2017. Below you can see a breakdown of all of the data collected from the 2016 survey. This interactive section offers you some tools to look closely at the data, to see it in different ways, and even to download all of the data if you want to do your own analysis. These tools were developed with the help of Detail Data, a Big Lottery funded partnership between NICVA and TheDetail.tv. You can make this section larger and the data easier to read by clicking on "full screen" in the bottom right corner. As you can see from the excerpt above, the problem with plastic pollution is only getting worse over time. Eight out of ten of the most found items on beaches in Northern Ireland were made of plastic, which represented 82% of all litter items found. A huge positive of this programme is the removal of all the litter observed by volunteers. As we are learning from this work, litter can travel quite a distance, and the majority of what we find is plastic bottles, cans and other examples of a 'throw-away consumer' lifestyle so could have come from anywhere. Marine litter isn't just a local problem. Plastic bottles and other buoyant litter can be pushed by wind and tides far from where it enters the sea, which in turn could be far from where it was dropped by an inconsiderate person. There are many ways marine litter enters the sea, and there are many ways it impacts the life in the sea, or impacts humans when it gets washed ashore again.